We are a emerging Supplier of ethnic umbrella. Beat the heat with designer and ethnic Umbrella, which will make you stand out of the crowd. The attractive color combination and unique embroidery has increased its demand in the market. 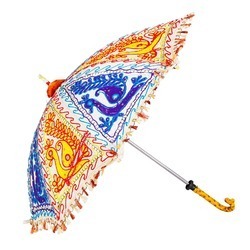 Our company is able to manufacture and supply ethnic umbrella. Bored with the regular black umbrella! This handcrafted umbrella made up of cotton cloth is essential for the approaching summer season. Prepared by traditional artisans of Jaipur. The exclusive design is decorated with the sparkling beads work on the top of the umbrella and finished with aari tari lace. We are one of the leading manufacturer of ethnic umbrella at our market place. Emerging supplier of ethnic umbrella. Being one of the admired organizations in the market, we have been engaged in providing exclusively made Ethnic Outdoor Umbrellas. We are providing to our customers at market level value ethnic umbrella. 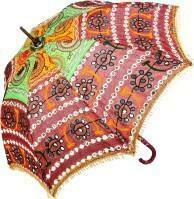 We are one of the best manufacturer of ethnic umbrella. We are able to manufacture ethnic umbrella, with the vast support of our team. Our company is one of the best supplier of umbrellas. We are providing to our customers a wide range of umbrellas at competitive prices. We have been able to offer our clients a qualitative range of ethnic umbrella. Our company is one of the main supplier of umbrella at competitive prices we are providing. We are one of the leading manufacturer of umbrellas at competitive prices. V S Damodarampillai & Co.